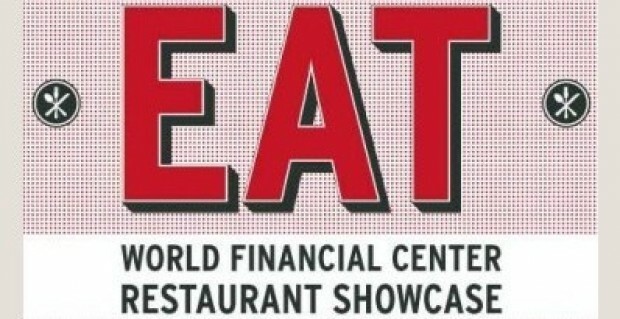 To all of you who work in or near the World Financial Center and are packing your lunch for tomorrow, or thinking about what to order from the usual catering menu, STOP!Â Look no further, because tomorrow, the restaurants at the World Financial Center are gathering in the Winter Garden to offer you $1-$5 samples of their signature items, as well as some seasonal selections. I managed to pick up a menu for the event on the way home, and many of the offerings seem very typical, such as P.J. Clarke’s mini cheeseburgers and pulled pork sliders (2 for $5), Au Mandarin’s pork and shrimp dumplings ($3 and $4 respectively), and Godiva’s chocolate-dipped strawberries, macaroons, and oreos. However, there were some stand-out seasonal items such as Columbus Bakery’s Corn Chowder with Pomegranate ($4), The Grill Room’s Wild Mushroom Risotto with Parmesan Sauce ($5) and Butternut Squash Soup with Caramelized Apples and Pumpkin Seeds ($4), Southwest NY’s Pumpkin Seed Crusted Salmon with Mango-Jicama Salsa ($5) and Financier Patisserie’s Apple Pumpkin Cake with Vanilla Cream ($3) and Pumpkin Cheesecake ($3). The Winter Garden and World Financial Center could look a lot different in 2013. Brookfield Properties are set to release their plans for updating the World Financial Center tomorrow, according to the Wall Street Journal. We’d heard rumblings of these changes, including the plannedÂ removal of the Winter Garden Stairs. In a Batteryparkcity.com poll, an overwhelming 90% of you were in favor of saving the stairs, a sentiment shared by 32BJ SEIU, a local union whose members work at the World Financial Center. City Planning Commission chairwoman Amanda Burden and Battery Park City community board members also question the removal of the stairs, an unintended icon of our post-9/11 reality. 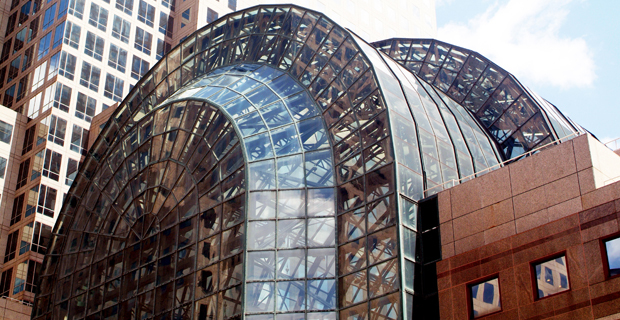 Brookfield maintains that the stairs need to be removed to allow for an expansive street level entrance that will connect with new PATH and subway stations at the World Trade Center. 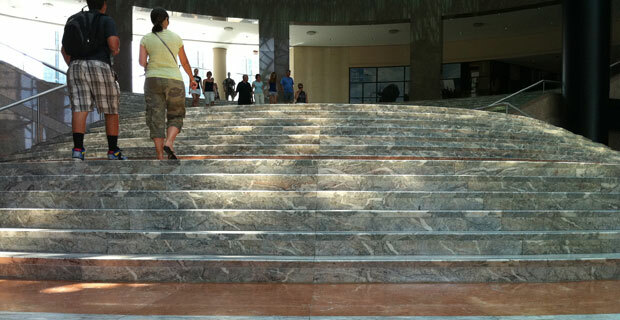 Stairs or no, expect to see more retail offerings in the World Financial Center. Citing the population increase in Battery Park City, Brookfield would like to offer more to residents who frequent the property on nights and weekends. Construction could begin as soon as the end of this year, with completion scheduled for 2013. 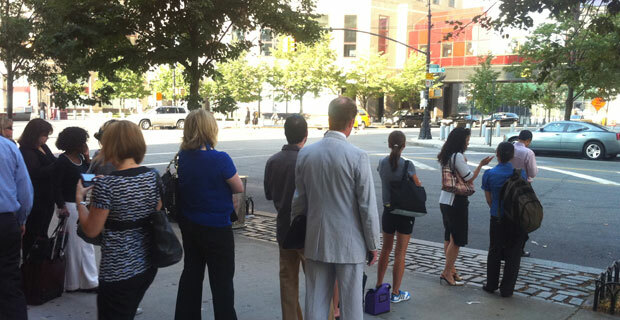 South End Avenue Cab Line: We are so civilized! 5PM is like the flute that charms our neighborhood cab line that snakes along South End Avenue at Liberty Street. This cab line never ceases to amaze me. It’s an interesting and distinct example of how Battery Park City is a special community. Is there another area in NYC that would relent to such self policed organization when participating in hailing a taxi — where in New York can be a full contact sport? Only at airports does such a cab line exist — but even those lines are policed by airport dispatchers. As a Battery Park resident, I will be the first to admit — I sort of appreciate the line. “The Liberty Street Stealth Attack” – When your happy to see a free taxi gliding onto Liberty Street when it pulls up to the stop sign – with a shadowy figure closing the cab door. “The I’m Overtly Stealing Your Cab Run” – When a person knows there is a line but runs to steal it anyways. “The Gateway Plaza Abyss” – When a cab enters Gateway Plaza and someone runs into the apartment complex to steal it. The history of the cab line is relatively unknown, but yet we as a neighborhood abide by this unspoken law. Sure, one could reasonably walk south where no such law and taxi order exists or revert to traditional hailing standards on West Street — yet I look for the line and stand on it whenever I need to leave the neighborhood. Granted that there is no written Constitution for this line — Â I’ve added some personal bylaws to it throughout the years. For example, if there are people waiting on the line — or if its raining/snowing, I ask the driver to drop me off at the line. If not in a terrible rush, I let a pregnant woman or a mother with several youngsters take the cab first. If I see neighbors with lots of luggage and I’m about to take a SUV taxi — I offer it up to them. While I have waited Â in line last week I noticed a trend of office mates who presumably work at the World Financial Center asked to share cabs and make drop offs. For executives waiting/sharing a cab becomes an extension of politics and the continuation of wheeling (pun intended) and dealing. In my mind goes to further explain how is this line is policed by employees who want to see other friends on the line. This has changed the way I see this line — as if waiting on the line itself becomes the activity. New York City is a highly competitive town. We compete for everything – jobs, dates, homes and yes, taxis. I guess what I’m seeking are some thoughts, personal stories or theories why this section of Battery Park City proliferates the taxi stand line … would love to hear them! Some of this year's award-winners (photo courtesy of ArtAndWriting.org). If you want to get a sneak peek at our nation’s next generation of great writers, painters, sculptors, fashion designers and filmmakers, here’s your chance. 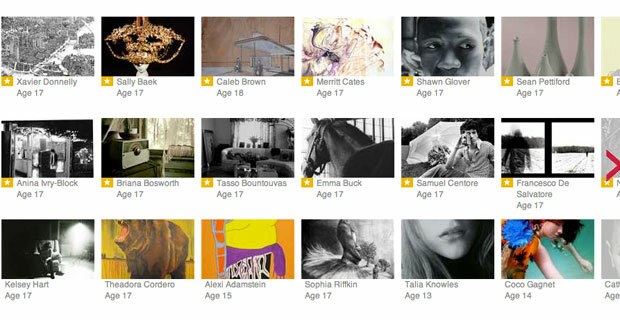 The works of the teenage winners of the 2010 National Scholastic Art & Writing Awards — which are presented by the Alliance for Young Artists & Writers — are on display at the World Financial Center’s Courtyard Gallery, now through June 25. For the bargain price of $0 (yes, it’s free), visitors can see film, video, animation, writing, photography, painting, sculpture, fashion, drawing, graphic design and ceramics exhibits from some of the most talented young artists around. This pre-fab home is pretty fab. The Hudson, an eco-friendly prefabricated home developed by Country Living Magazine in conjunction with design-building company New World Home, will be on display at the World Financial Center (quite appropriately, on the banks of the Hudson River) from June 4 through June 17… before moving on to its permanent address in Vernon, New Jersey. 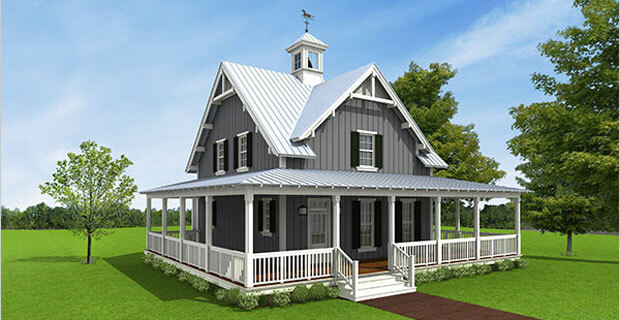 Constructed in a factory in just 100 days, the two-bedroom, 1,600-square-foot country cottage boasts fireplaces, gargantuan windows, a 1,100-square-foot wraparound porch, and a stylish and “green” interior decoration courtesy of New York designer Katie Ridder. Comprised of six modular pieces, it’s also super easy to put together — assuming you own a 100-ton crane.